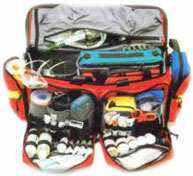 Emergency Medical Kit - $800. 1 set of blood pressure cuffs in 2 Sizes - adult and child. & additional supplies and equipment. A dedication can be inscribed on the kit.